As the Community Engagement Coordinator Eduardo Rivera is the primary liaison with Vecino’s community partners. Eduardo Rivera cares a great deal about the Houston community – and it shows. “My passion is to help people get the resources they need,” he says about the years he’s spent building connections and fostering partnerships in service to residents of Houston and Harris County. Rivera recently joined the team at Vecino as the new Community Engagement Coordinator. A well-known leader in the Houston area, he brings with him a wealth of experience implementing successful projects within the healthcare system and beyond. Rivera spent the past seven years as the Community Partnership Development Team Lead for Harris Health, where he was instrumental in building strong partnerships throughout the county. Outside of his work in healthcare, Rivera volunteers as a Senior Program Coordinator with Remove Hunger and is an active leader in Houston’s Salvadoran community. He currently serves as Board President of Asociación de Ex-Futbolistas Profesionales Salvadoreños en Houston and Vice President of Consejo de Comunidades de Salvadoreños Residentes en Houston. As Vecino’s Community Engagement Coordinator, Rivera will serve as primary liaison with community partners. His work will include hosting community engagement events, facilitating idea partnerships, and expanding outreach programs in collaboration with aligned organizations. 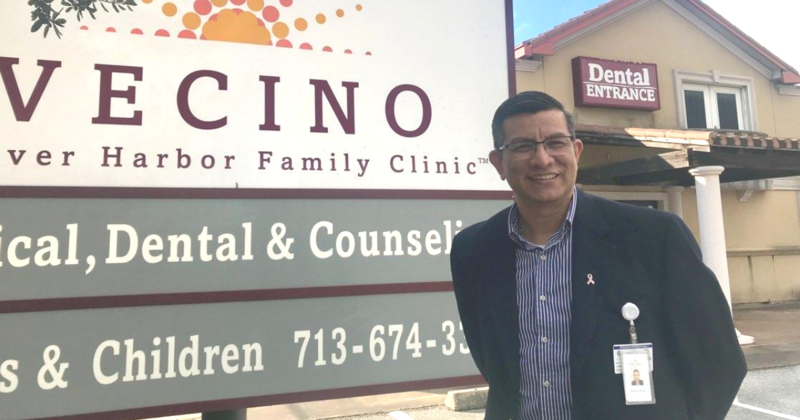 Of his new role at Vecino Health Centers, Rivera says he looks forward to leveraging his strong relationships with school districts and organizations throughout the city, and also finding new ways to reach working families. And if his reputation in the community is any indication, Rivera will do it all with his signature dose of energy, drive, and compassion.